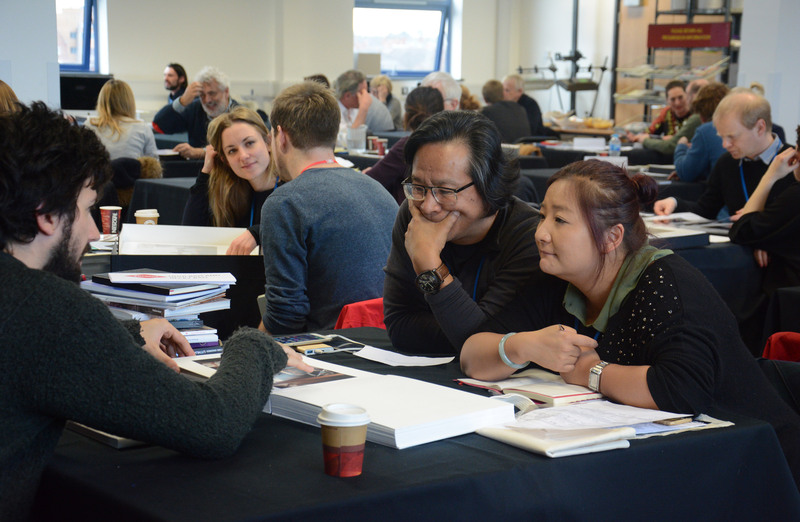 Professional Development Day: Portfolio Reviews A unique opportunity for photographers to have their work seen by some of the UK's photography festival curators as well as Scotland's photography galleries and projects. Reviewers: Louise Clements (FORMAT); Angel Luis Gonzales (PhotoIreland); Gillian Gilbert (Carlisle Photography Festival); Malcolm Dickson (Street Level Photoworks / Season of Photography); and Ben Harman (Stills / Season of Photography). Ángel Luis González Fernández is the founder and Director of PhotoIreland. The organisation celebrates Ireland’s International Photography festival every July. He launched in 2011 'The Library Project', a publicly accessible collection of publications around Photography, holding today over 1200 key items from 220 publishers worldwide. Today, The Library Project premises are also host to an Art bookshop and a gallery. Ángel won the David Manley Entrepreneur Award 2011 in the Arts category. He has reviewed in festivals like Les Rencontres d'Arles, and published books like ‘Martin Parr's Best Books of the Decade’ in 2011, and ‘New Irish Works’ in 2013. He has designed books for photographers such as Miriam O'Connor, David Farrell. As a reviewer, Angel wants to help photographers and artists with their practice at any stage, and guide them on particular projects, no matter the level, quality, or content. Anna Bridges and Gillian Gilbert have been involved with the organisation of Carlisle Photo Festival since it began in 2012, and subsequently became co directors in 2014. The festival has grown exponentially over the last few years; featuring work from national and international photographers. The festival has many links with other photography organisations such as Street Level, Redeye and the Visualising Conferences. Mainly concerned with exhibiting series of work with a conceptual bias, CPF utilises public and unusual spaces to both promote photographers work and engage with a wide audience. As co directors of Carlisle Photo Festival we are keen to see bodies of work that deliver strong conceptual narratives and are particularly interested in supporting new and emerging photographers. Not interested in seeing Fashion or Commercial work. Ben Harman is Director of Stills: Centre for Photography, an organisation that was established in 1977 and is based in the heart of Edinburgh. From 2003-13 he was Curator of Contemporary Art for Glasgow Museums where his curated projects included Barbara Kruger (2005), Jim Lambie: Forever Changes (2008), Unsettled Objects (2009) and Tales of the City (2012). From 2007-12, Ben was Lead Curator on Glasgow’s Art Fund International collecting project. Ben would like to see a broad range of work to get a sense of approaches and ideas that are being tested. Hoping to see something new, be asked lots of questions and have good conversation about art and photography. Louise Clements is Artistic Director of QUAD, a centre for contemporary art, film and new technologies, since 2001, and Artistic Director of FORMAT International Photography Festival since 2004. An independent curator since 1998, she has initiated commissions, publications, mass participation, art, film and photography exhibitions. She is a juror, portfolio reviewer, workshop leader, speaker and award nominator throughout Europe, America and Asia. Guest curator at - Habitat Centre and Haus Khas BlowUp (Delhi, India 2012); Dong Gang Photography Festival (South Korea, 2013); Dali Photography Festival (China, 2013); Noorderlicht 20/20 (Groningen, Netherlands, 2013); Photoquai Biennale (Paris, 2015); Christophe Guye 2020vision (Switzerland 2015); Les Rencontres Arles, Discoveries (France 2015); Hamburg Photo Triennial (Container City, Germany, 2015); Obscura Festival (Malaysia 2015); Venice Biennale, EM15 (2015); Slideluck Rome (Italy 2015). She writes for books and magazines, guest Editor for OjodePez(Italy), HijackedIII (Australia), PhotoCinema(uk), South Korean Photography Magazine. Editor at Large for 1000 Words www.1000wordsmag.com . Advisor to WYNG Master Awards Hong Kong and the Artists Pension Trust. Louise is keen to see photographers who are interested to discuss ideas and she is open to see work at any stage of project development. Interested in anything from documentary, photo-journalism, archive, photo/cross artform installation and contemporary/narrative photography, including film and performance. She is less interested to see travel, commercial, advertising, stock unless they fit into the above. ‘Maud Sulter – Passion’, ‘Working the Border’ for Carlisle Photo Festival, ‘Common Ground: New Documentary Photography from Scotland and Wales’ featuring Document Scotland and A Fine Beginning photography collectives; ’Digital Play; Wendy McMurdo, Collected Works (1995- 2012)’. In 2008 he initiated Futureproof, an annual exhibition showcase of new talent from the Scottish art schools and colleges, and has been a partner in the Jill Todd Photographic Award for the past two years. Street Level are currently co-organising a Season of Photography which links a diverse series of exhibitions and events around photography across Scotland which runs until September 2015. Can offer photographers advice in moving forward in their art practice and in any opportunities available to them. Also partial to viewing bodies of work which combine new approaches to documentary with a conceptual awareness; social documentary/tell a compelling story; lyrical and narrative; work which pushes at the boundaries of image-making. Michael has been Director of Belfast Photo Festival since 2009 and initiated as well as curated numerous commissions on exhibitions of contemporary art with a particular focus on photography. In his role he curates the varied programme of artist talks, symposiums, residencies, workshops, short films and exhibitions per year. He has recently judged for the 2015 Circulations Photography Festival (Paris) and European Heritage Week. He also reviews internationally, including Les Rencontres d'Arles (France), Singapore International Photography Festival (Singapore), East Wing (Dubai) and Chobi Mela (Bangladesh). Open to seeing a range of work. Paul McGuckin is a photographer and founder of Remote Photo Festival. He holds an MFA from University of Ulster and was a commissioned artist for Derry/Londonderry City of Culture 2013. His work has also been exhibited at the Gallery of Photography & Stormont. Remote Photo Festival is inspired by the unique challenges facing artists living and working in remote and rural areas and is located in Donegal, away from the usual distractions of large urban areas, but with its own bedrock of resilient artistic endeavour. I’m interested in the endeavour required to make work in a remote context, but it’s a wide brief, it isn’t all about the landscape, I’m especially interested in unique views on our theme. 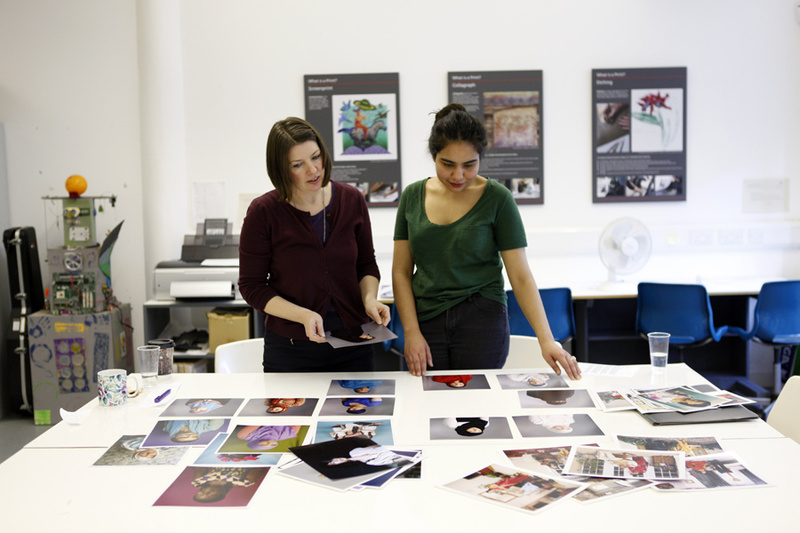 Left Image: Marjolaine Ryley and Arpita Shah at the 'In Focus' portfolio reviews at Street Level in November 2013.